Bristol Volksfest is a traditional Volkswagen show and family camping weekend. If you're a VW driver (or just a fan) air-cooled or water-cooled, whatever the generation, this is the show for you. 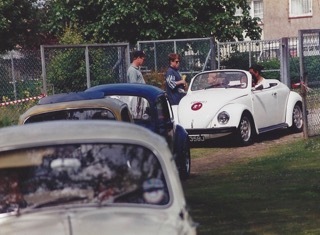 1992 saw the very first Bristol Volksfest held around a football field in Almondsbury, Bristol. The brainchild of founder Adrian Ashby, who at the time was running KGC Panels and VW Dream Machine Bristol - a car parts, panels and paint business also specialising in VW parts and accessories. It wasn't until he acquired a certain white VW wizard (seen in top left photo above) that he understood the widespread love for the love bug and the massive UK Volkswagen following. Bristol Volksfest started as a hobby, creating an opportunity for like minded VDub enthusiasts to come along and put their pride and joys on display and swap parts, knowledge and appreciation for the iconic vehicles. From there it has evolved naturally over the last couple of decades into one of the biggest VW shows in Britain. It was for many years just a one day event and it's only in the last 8 years that it's become an action packed family weekend with camping. If you're new to Bristol Volksfest or the VW scene - we focus on all the best things VW, from air-cooled to modified and across all generations, culminating in a huge show & shine on Sunday. We mix that in with the best of Bristol culture, whilst encompassing the modern day V-Dub way of life. If you’re a VW driver, air-cooled or water-cooled, music lover, bargain hunter or you enjoy chilled vibes and a relaxed family atmosphere - Bristol Volksfest is for you. Join us at Bristol Volksfest and be a part of the largest grassroots VW festival in the South West. Bristol Volksfest is one of three shows organised by the same dedicated group.